The 800-block of Robson street in Downtown Vancouver was permanently closed to traffic in April 2016. The intention was to convert the square into a location for social events and civic and cultural creativity with proper seating, lighting, and landscaping. Instead, Robson Square has become a bustling marijuana market. I regularly walk through Robson square on a daily basis because I work in a building just one block away. At first, the single-stand set-up near the bushes in the area was a charming, very “West Coast” quirk that tourists seem to love. The lone cannabis seller was off in the corner, barely noticeable except for the constant plume of smoke hovering around his table. Lately, though, there have been at least of five or six more tables set up around the square, complete with canopies and sellers shouting the prices of their edible THC products at passers-by. The atmosphere is reinforced by booming music and a constant barrage of marijuana-themed products and accessories displayed around every turn. This is no longer a quirky anomaly. These illegal vendors have taken over what was intended to be a family-friendly plaza. Whether you’re a marijuana supporter or not, there are safety concerns that come with selling to underage buyers and a lack of regulation of the THC-laced food products that they’re selling there. One of the other concerns with the market is whether or not it’s fair that marijuana vendors are working alongside legal food carts. There are vendors and buskers who make their livelihood working in and around the square. The application and permit fee for food cart vendors this year is over $1,200. This permit comes with a guarantee that the vendor has health permits and liability insurance. They are also required to undergo a health inspection. The argument that these sellers use to defend themselves is that cannabis is set to be legalized this summer. They claim that they always ask for identification to confirm that potential buyers are over 19, and that they’re providing a necessary service for people who use marijuana for medicinal purposes by being there. But according to a poll by The Vancouver Sun, 80 per cent of readers don’t think the pot market should be allowed to operate. After increasing media coverage of this issue, five people were arrested for selling marijuana in the square and police seized much of their inventory. Some vendors have returned, however, to protest for fair access to cannabis. They were seen giving out the drug for free to pedestrians. While food vendors and cannabis sellers seem like they could have a complementary relationship, it simply isn’t fair for illegal suppliers to get away with operating unlicensed while other hardworking merchants lose out on business in the space that they pay for. Without regulation, there is no way for health and safety standards to be established for these suppliers. 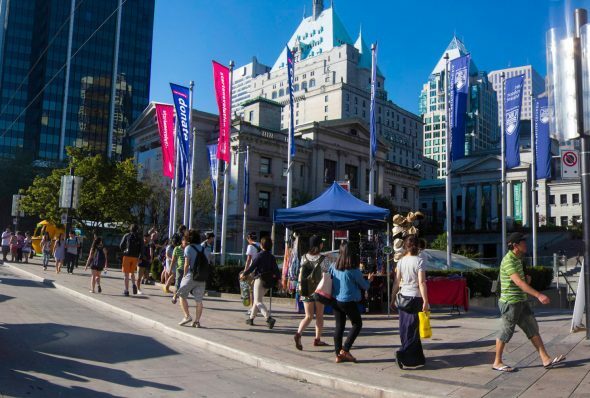 In order for Robson Square to work as a functional, family-friendly area, parameters need to be set for all of its vendors.